Endangered in the wild but thriving with conservation efforts- Dama Gazelle hunting in Texas gets you a rare, truly one of a kind trophy. A trip with us is more than just hunting, we create strong friendships, lifelong memories, and we truly give you the adventure of a lifetime. Nestled in the south Texas scrub overlooking Texas Hill wine country lies Living Waters Ranch. 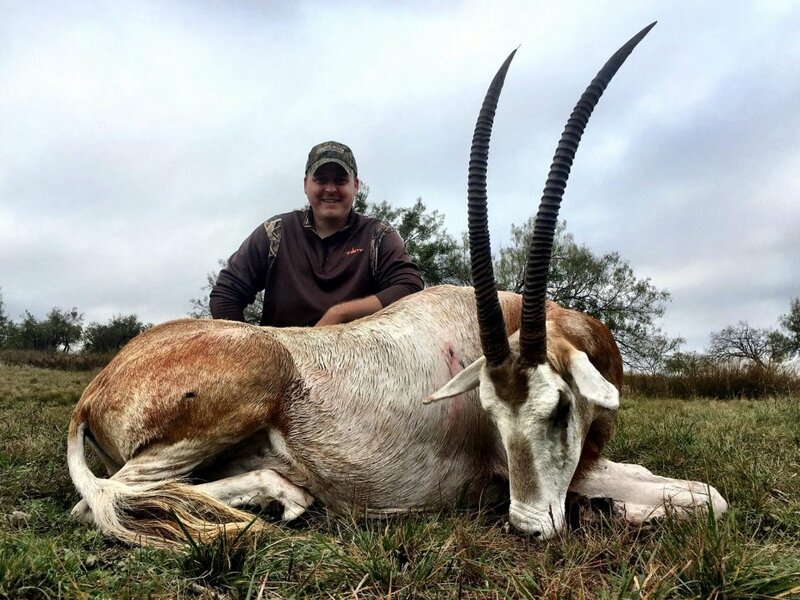 This perfect getaway features the best guided Dama Gazelle hunts in Texas as well as non-hunting activities ensure the entire family has the time of their life. Our Lodge features over 10,000 square feet of luxury waiting to pamper you. The best kept secret of central Texas! The Lipan Springs lodge is a prestigious classic western style ranch with room for up to 10 hunting clients. Simple pleasures of communal dining in a relaxed atmosphere and private access into our two large spring-fed lakes - with excellent fishing is just a prelude for what the adventure that awaits you. The high point is our low pressure trophy Dama Gazelle hunting reserve! At our 3rd generation Cenizo Ranch, we believe in lasting family connections with a ‘back to basics’ approach. Both native and exotic species roam the landscape surrounding our rustic 1,200 square foot Cenizo lodge, where you’ll enjoy southern Texas hospitality at it’s finest coupled with unprecedented Dama Gazelle trophy hunts. Experience for yourself and up to 8 people, this comfortable retreat at the end of your hunting day. If it’s an exciting hunt you’re looking for, the Dama gazelle is a great trophy for you. From the long, powerful legs to the piercing eyes, this exotic gazelle will test all of your hunting skills – and reward you with a trophy that’s worthy of all the stories you’re bound to tell. With our personal guide at your side, tracking and stalking these elegant animals across the open grasslands is a non-stop thrill, even for the most seasoned hunter. 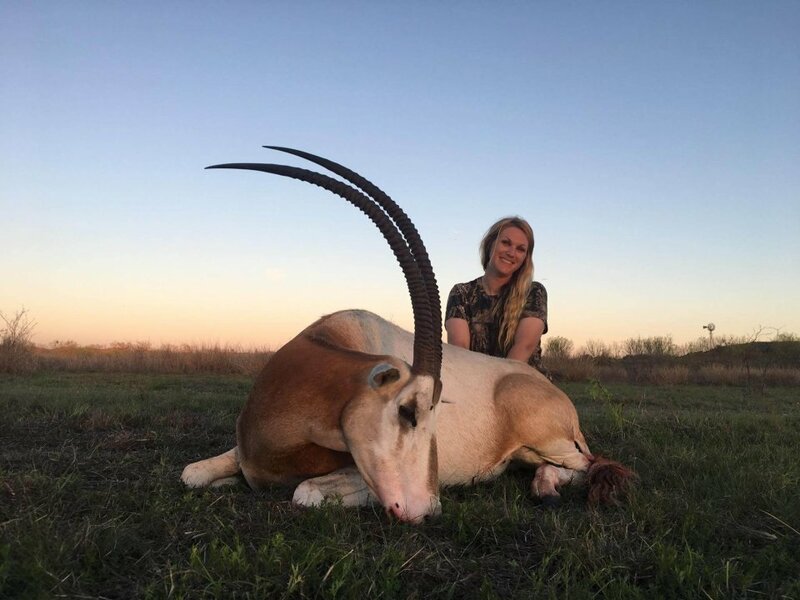 A true Safari style hunt - your guided Dama Gazelle trophy hunt will require hiking and panning the wide open grassy lands and mixed herds of 10-20 head to bring down your prize. Once you set your goals for an elegant Dama Gelle, then the real work begins. 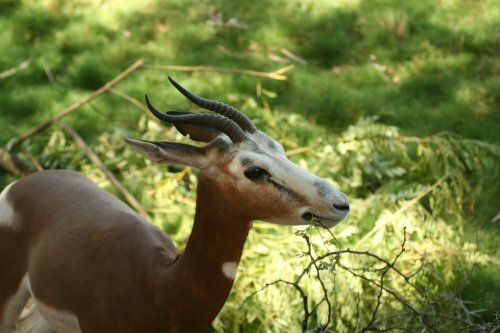 Grazers by nature, the Dama gazelle can’t pass up tender shoots and fruit. The Dama is always on alert – and incredibly fast. Your guide will coach you in the skills needed to stalk and add this trophy to your collection. With a healthy diet and watering holes, the Dama lifespan is about 18 years on the ranches. Most at home on the open grasslands, the male Dama establishes territories – although multiple groups will comfortably interact at watering holes. Although smaller than other trophies at 12-15”, the sweeping ‘S’-shape of the Dama gazelle’s antlers are impressive in their own rights – and on your trophy wall. Active during the daytime, stalking a herd of Damas is exhilarating.